When Android Wear burst onto the scene last year, the designs that accompanied the first batch of smartwatches weren’t the most attractive. 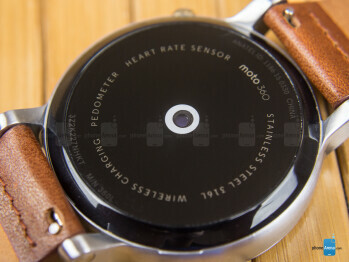 Thankfully, the folks over at Motorola impressed many with the Moto 360 and its round face style – arguably the best-looking smartwatch at the time. 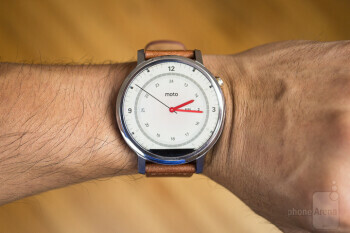 Fast forward to a year later, we’ve seen a handful of smartwatches that boast even better designs, trimming off more of the fat to make them a bit more proportional looking. 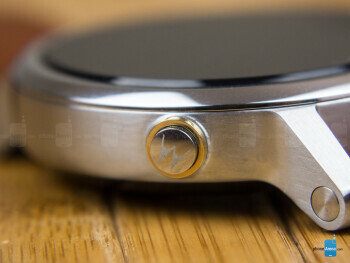 Back for round two, the second generation Moto 360, also known as the 2015 model, has some tougher competition to contend with, so it’ll need a compelling package to rise above the pack. 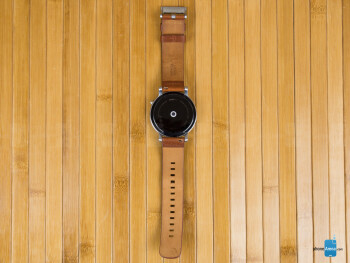 No other watch can touch the Moto 360’s diversified level of customization. 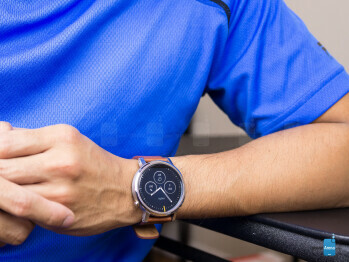 Motorola did it first, delivering a round face design to an Android Wear smartwatch with the original Moto 360, so it’s back again here with the 2nd generation model. What’s apparent right from the onset is the addition of lugs to its chassis – whereas before, the straps seamlessly blended in with the casing. While it technically increases the footprint, it’s still boasting one of the highest scree-to-case ratios around in a smartwatch, thanks in part to how skinny the bezel is around the display. With the addition of the lugs, it means that replacing the watch strap is considerably easier this time around. In fact, it’s a snap because of the new quick-release bands that are now employed, whereby replacing the strap is done by just sliding the pin release lever that’s on the strap. And yes, there are quite a bunch of straps to choose from – whether they’re the simple leather bands from Horween, or something more sophisticated with the aircraft-grade 316L stainless steel ones. What really sets apart this new Moto 360 from all other smartwatches out there is the incredible customization that’s offered through Moto Maker. Nearly every aspect of the Moto 360 can be customized to your liking, from the color choice of the chassis, to the strap that accompanies it, and even a micro knurl treatment to the bezel, it offers a higher degree of personalization that’s unmatched. And yes, there are even more styles and sizes to choose from! In addition to the 42mm and 46mm ones that are available from the men’s styles, Motorola also offers a 42mm case size for women – so its size isn’t as overpowering on the wrist. Our particular review model is a 46mm men’s style watch, which features a gold micro knurl bezel, gold casing, and an accompanying gold metal band. Needless to say, it has a refined look that meshes well for formal occasions, but it can easily become something that’s fitting for casual wear if we’re to use the leather strap. Of course, going with the premium look means that it’s accompanied with a premium price as well – $450 with this particular configuration. 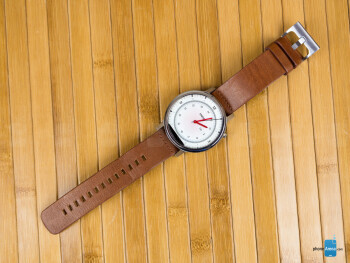 However, the base 42mm men’s style watch with a leather strap fetches for $300. This time around, the single button on its side has been repositioned to the 2 o’clock setting. However, it still features a heart rate sensor on its underside, as well as wireless charging using the included cradle. You also will have peace of mind knowing that it features an IP67 rating as well, which means that it can withstand immersion in up to 3 feet of fresh water for up to 30 minutes – albeit, they really dissuade you from submerging it. It’s sharper than before, but the ‘flat tire’ look has to go. This year’s model continues the trend of offering a round style display, one that happens to have the same ‘flat tire’ look as before. After checking out several other round face smartwatches, we would’ve preferred to have a full circular display as opposed to this, even though the area below the display is used to hide its ambient light sensor – so it can automatically adjust the brightness accordingly. Our 46mm review unit sports a 1.56-inch 360 x 330 backlit LCD display – while the 42mm options carry a 1.37-inch size with a resolution of 360 x 325 pixels. Either way, it’s sharper looking than its predecessor, which came with a 1.56-inch 320 x 290 panel. It’s less pixelized this time around, offering crispier looking details. While it’s bright enough to view under sunny conditions, there’s just a slightly subdued tone to its color reproduction, which becomes more profound under wider viewing angles. And we’re not a fan of how the Gorilla Glass 3 is raised higher than the Moto 360’s case, seeing that it’s more prone to coming into contact with surfaces. It’s not that bad looking of a display, honestly, but we’ve seen more outstanding ones from LG, Samsung, and even Huawei. Adding to that, the flat tire look of the display is bothersome, especially when some of the tick marks with its watch faces don’t show the ones near and around the 6 o’clock mark. 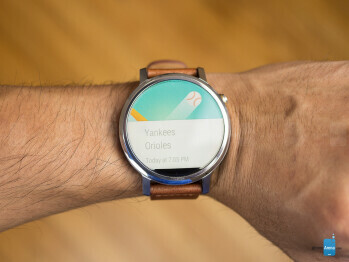 Veteran users of Android Wear will fit right in with the software of the 2nd generation Moto 360, since the experience is no different or unique from other Android Wear watches. For the most part, it’s still largely a hub for notifications with the way cards are presented to us. We won’t go into all the nitty-gritty details, but we will mention that it does decently to complement the smartphone experience with its set of apps. Navigation is done with the usual swiping gestures; however, interacting with many of the apps is still achieved through voice actions. Even though it’s functional in the way it alerts us with important things, like incoming _phone_ calls, traffic along our route going home, the weekend weather forecast, and much more, Apple’s WatchOS offers just a little more depth in terms of the overall experience. Of course, updates to Android Wear that will increase its worth are hopefully coming soon, but for right now, it’s still by and large reserved as a notifications aggregation hub. We will point out two noteworthy additions here with the new Moto 360 that you won’t find in other Android Wear smartwatches. The first one, Live Dials, provides even more information at a glance with the new watch face – such as the battery level, weather condition, and step tracker. And you can even personalize these new Live Dials watch faces, choosing the color, and even what information you want it to show. Secondly, the new Moto Body app is an enhancement over last year’s Heart Activity app, which is a comprehensive health and wellness experience that provides us with useful feedback to living a healthier lifestyle. Fortunately, there are no more delays or jerky movements with the operation of the new Moto 360, just because its new quad-core 1.2GHz Qualcomm Snapdragon 400 chip with the Adreno 305 GPU and 512MB of RAM ensures smoother results. Everything now has a tighter response with the Moto 360, so navigating through the interface and running apps are all accompanied with a snappy performance. It’s a comforting improvement, making for a more pleasing overall experience. Donning 4GB of internal storage, it’s a decent tally that not only allows us to store some apps natively on the Moto 360, but we can even use it to store music as well. 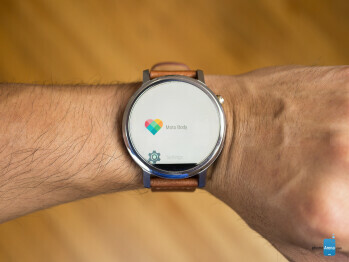 In addition to its typical Bluetooth 4.0 LE connection, the Moto 360 offers a truly untethered experience thanks to Android Wear now supporting Wi-Fi connectivity. Therefore, it doesn’t strictly need a smartphone and Bluetooth connection for data connectivity. However, it’ll only connect to existing Wi-Fi networks that our smartphone has already connected to – there’s no option for sniffing out and connecting to other networks strictly through the Moto 360. The missing element in all of this is a dedicated cellular connection to widen its use even more. We get longer battery with this year’s model, but it’s nothing extraordinarily better than the competition. Again, the battery capacity varies depending on the size – so it’s a 300 mAh for the 42mm option, and a larger 400 mAh one with the 46mm one. The battery life produced by our unit is an improvement over last year, thankfully, getting in a good 1.5 days of normal usage with the display set to its maximum and the always-on screen feature to on. By the end of the night, we’re usually around the 45% range, which is enough to carry us into the second day, but definitely not enough to overcome it. Still, we’ll gladly take the improvement. Arguably, the most compelling part about this year’s Moto 360 is that there’s just significantly more diversity with its design – one that has yet to see any sort of close competition. We really enjoy the idea of customizing the look of the smartwatch in almost every facet, mainly because most other ones are available in few choices. The base price, too, seems adequate at $299.99, especially when there’s still some degree of customization at our disposal. Despite this, we’ve seen some wicked competition in the space of late. Even though the original model stood out at the time for its attractive rough style design, everyone is pretty much on the same boat nowadays with their offerings. Yes, we enjoy the flexibility in the outcome of its design, but the display is tiresome with its flat tire look – not to mention, other display technologies have proven to be more astounding. On top of that, Android Wear’s experience hasn’t changed all that much in the course of the last year. Buy the 2nd generation Moto 360 if you have a penchant for a unique look, but as we’ve seen already, the LG Watch Urbane and Huawei Watch offer similarly premium designs – while also offering better looking displays than the Moto 360.